I find the endeavour well worth pursuing, and if I can make a suggestion: how about an inner bezel, either with 60min count-up (as is on the dash-chronos) or 60min count-down, and as a third option, 12h scale for a second time-zone. Yes I made thoughts for a rotating inner bazel, Navitimer style, but it's way too early and they arte just thoughts. As I said, I designed this watch just for myself and at this stage I want to focus to make it as close as possible to my own original design that is a wristwatch version of the iconic A-13A clock. There are some important details (crown, case back, hands..) that still need to be improved and I want first to address them before everything else. 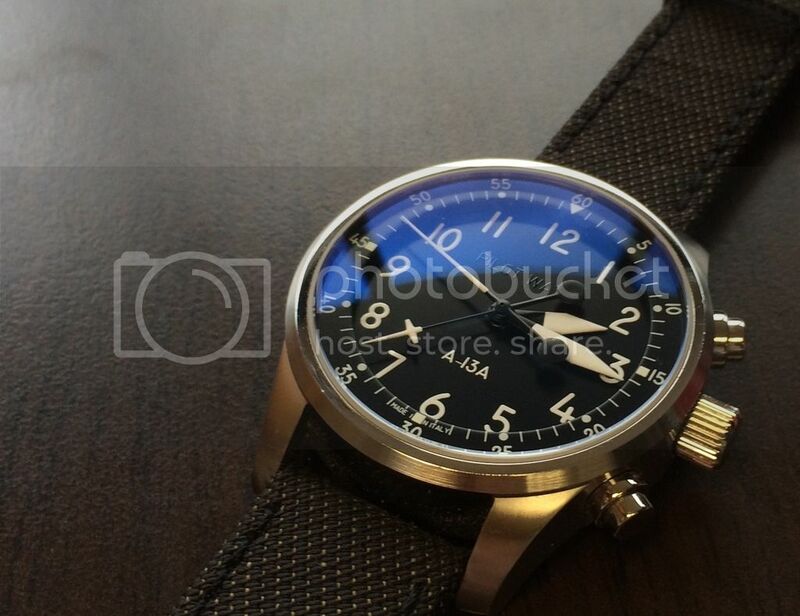 As soon as the layout will be consolidated, I want then to test it as much as I can that is to say spending some good time in the cockpit and honestly see how it performs compared to other pilot watches I have. Then will see, but yes, apparently there are quite a lot of people asking for that so providing that everything goes OK, I should eventually make a cost analysis for a small batch....I feel like I'm putting myself in troubles . Last edited by paolorange; March 17th, 2016 at 12:21. Milos and saltddirk like this. Hunterfate, Karsten and parsig9 like this. The new semi-matt (or semi gloss? ) hands are now installed and almost everybody likes the new configuration much more. The lesson learnt is that the color of the dial, of the hands and the glass interact together A LOT and it's very very difficult to make a reasonable forecast of the final result based on a guess. I'm now waiting for the new crown and the new case back with much deeper engraving. Apparently ETA is not selling to individuals the AcuDrive version of it's 251.264, so I have to remove from the back the text "Thermocompensated Quartz" and replace that with ETA 251.264 Quartz. Does it make any sense to you? Dennis Smith, ceanag, Milos and 6 others like this. I'm also thinking to have it engraved with a small symbol. I choose the Greek letter "Alpha" since it represents the angle of attach, the most iconic physic/aviation symbol ... I hope Omega won't take that too badly . Where or how did you get that dial printed? However, since it's a one-off and not for commercial sale, there's not much a trademark holder can do anyway. Obligatory IANAL. Beautiful watch, by the way. Question to everybody: what if I replace the "Alpha" on the crown with a NACA airfoil? eljay and Milos like this.